Andrew McCabe, Former Deputy FBI Director, Launches Legal Defense Fund Andrew McCabe's attorney says he needs help paying for the costs associated with potentially defending himself in court — and possibly suing Donald Trump. 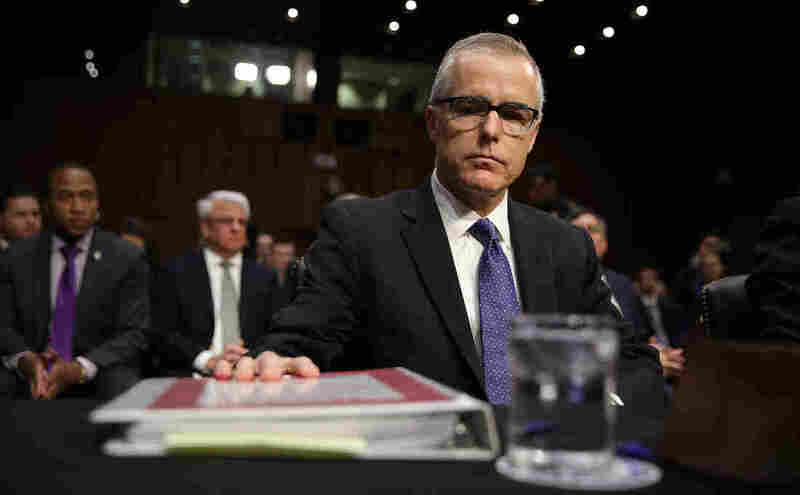 Former FBI Deputy Director Andrew McCabe, seen during a Senate intelligence committee hearing in May 2017, has launched a legal defense fund to help cover the costs associated with congressional investigations, the U.S. Attorney's Office and potential litigation. The trustees for the fund include former judges John Martin and James Robertson and the former police leader in Washington, D.C., and Philadelphia, Charles Ramsey. McCabe's lawyer, Michael Bromwich, told reporters Friday morning that he recently met with prosecutors in Washington considering a criminal referral of McCabe for an alleged "lack of candor" to Justice Department Inspector General investigators. Bromwich said he pledged cooperation with prosecutors, whom he said were in "listening mode." "All institutions are fallible," Bromwich said. "In this case I think they have got it horribly wrong," he said of the inspector general's report on McCabe. "We really hope that the case is going to be evaluated on the merits, not based on the president's view." McCabe has been a longstanding political target of President Trump, both in public comments and in newly declassified memos by former FBI Director James Comey. Trump is described as raising the subject of McCabe several times in his meetings with Comey. Bromwich decried Trump's "continuing slander" against McCabe. "We've never seen anything like this before. It does damage not only to Andy McCabe individually but also to the FBI as an institution." The lawyer said that McCabe looked up to his onetime boss, former FBI Director James Comey, but that they remember differently their conversations about contacts with The Wall Street Journal in 2016 about the Clinton Foundation investigation. Bromwich said McCabe "is very upset and disappointed" about remarks Comey has made about him to NPR and other outlets recently — in which Comey said that although he likes McCabe personally, he is confident that he didn't know in advance about the plan to arrange for information to reach the Journal. Attorney General Jeff Sessions fired McCabe last month based upon internal recommendations from within the FBI and the Justice Department; McCabe's camp says he acted within his authority and told the truth about it afterward. Bromwich, who served as the Justice Department's inspector general from 1994 to 1999, said he had never seen an internal DOJ disciplinary process progress so swiftly. The speed, Bromwich said, raises real questions about possible improper influence from Trump. "It's absolutely clear that this process was accelerated in order to terminate Mr. McCabe and deny him his pension and retirement benefits," Bromwich said. "The speed with which this thing moved was unprecedented." McCabe remains eligible for some of his law enforcement pension, but he will have to wait several years to collect it. And for now, he has no access to health care benefits he would have had if he had not been fired on the verge of his 50th birthday, a spokeswoman said.